Notes: Rocky Mountaineer's newest Goldleaf service domes are a bit of a departure from the previous domes in the fleet. The most noticeable exterior difference is the use of the larger glass window panes in the dome section, which now span across two seat rows instead of the single row-width panes that were used on the previous 10 cars. Like the 9521, which was delivered in August, 2003, 9523 (which was delivered March 31, 2004) is also six inches taller than the original cars, adding three inches of additional head room to both levels. There are several interior differences as well, which have forced the shortening of the observation section slightly. Also, the service bar has been relocated from the dome end to a spot closer to the center of the car. 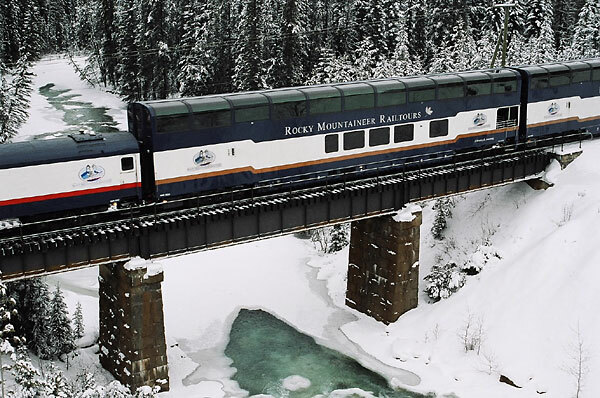 When delivered, the 9523 will join a fleet of 11 cars providing Goldleaf service on RMR's two-day rail cruise offering between Vancouver, BC and Jasper, Banff and Calgary, AB. RMR has enlarged its fleet by an average of 1-2 cars per year since purchasing the 9501 in 1995. 9523 will be a B car, with an observation platform and small lounge/gift shop supplanting a smaller than normal galley next to the dining area. We had the chance to walk through the 9523 while is was being constructed at Colorado Railcar's Ft. Lupton plant. Click here to see some photos of the car in the early stages of construction. Kamloops, BC. May 14, 2004. Photo by Jody Moore.